Here at the Ocala dental blog, we never like to be the bearers of bad news, but we are dedicated to our patients’ oral health. So, today we offer an essential warning about a lesser-known danger of sticky candy. Most Marion County, Fort McCoy, and The Villages residents probably know that sugar is not your teeth’s friend. Eating candy creates the perfect environment for harmful, cavity-causing bacteria to thrive in your mouth. 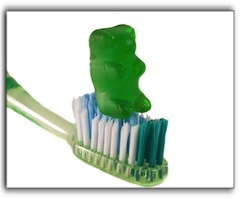 Did you know that the physical toll of chewing on sticky candy can lead to (or aggravate) a condition in the temporomandibular joint called Temporomandibular Disorder (TMD)? The jaw is a delicate joint and sticky candy increases stress and the possibility of taking the jaw out of alignment. Worried about giving up the sweet stuff? Remember that when you stop eating highly-sweet things, your taste buds adjust and you will enjoy foods with more subtle flavors, such as fruits. So don’t give up! Your taste buds will change and your teeth and jaw will thank you! Hi. I’m Dr. Wayne Harper of Dr. Wayne C. Harper in Ocala. If you hear a popping or clicking noise in your jaw, have pain in your jaw or around your ears, or feel like your bite is out of alignment, call 352-867-7181 to make an appointment today. TMJ issues can frequently be treated with non-invasive methods including including relaxation techniques, diet and lifestyle modifications, or orthodontic treatment. Physical therapy is often effective for treating more severe cases of TMD. If necessary, I can refer you to a physical therapist who specializes in TMD treatment. During your examination, we can also discuss pain management. Along with healthy teeth, we also want you to have an extraordinary smile that you can be proud of. If you have any questions about teeth whitening in Ocala, smile makeovers, or other cosmetic dentistry procedures, give us a call today at 352-867-7181.